Camouflage is used extensively in the military, but its other applications may surprise you. 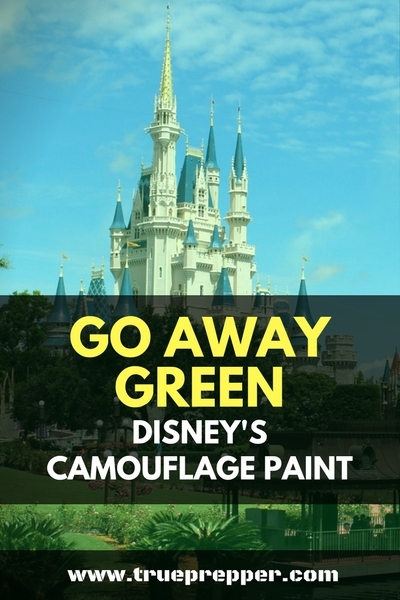 Disney was a pioneer in using camouflage commercially and developed a specific shade of paint for this purpose: Go Away Green. The Disney theme parks aim to provide an immersive experience, and they use all sorts of tricks to achieve this. Painting things that they do not want you to notice a certain shade of green is one of these tricks. Disney was obviously not the first to use a special shade of green for camouflage. Olive drab was a solid color camouflage used on US Soldier uniforms during World War II. A few variations of the color existed before the war, but the olive drab camouflage color we know today was in place by the time the US jumped into the fray. It made its way onto all sorts of equipment- from jeeps and motorcycles to radios and tents. By the time Vietnam rolled around, multicolored patterns replaced the solid uniform color, but olive drab is still on all sorts of military equipment to this day. “OD Green” has become a mainstay in the military and law enforcement community, and almost all tactical equipment comes with it as a color option. Go Away Green is a specific shade Disney uses to make less-magical structures and details blend in with the landscaping. They slather it on everything they want their customers to overlook; utility buildings, employee entryways, trash cans, and even large business buildings. It is a grayish green similar to the olive drab, and really for a similar purpose. Rather than making things blend in to hide from your enemies, Disney is using it to create an illusion of a magical world where bland everyday buildings are not there. It is surprising that they do this by making them even more bland. 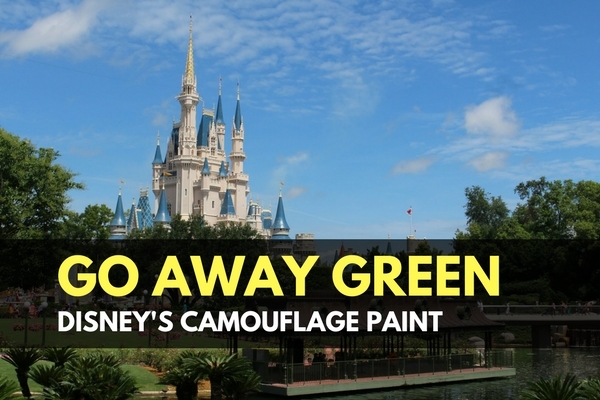 Similar to the way the military developed OD green, Disney put in the research to develop the various shades of Go Away Green. It is specially formulated to blend in with a wide range of backgrounds. Building, asphalt, shrubbery, and even the sky all make for a backdrop that Go Away Green disappears against. Science shows that our eyes are lazy and prefer to focus on contrasting items and things with consistent patterns. This is why camouflage works in the first place, and these green shades blend well enough to hide contrasting shadows and depth patterns. Disney uses it in a wide variety of places. Trim on their building, large structures that loom in the background, and even the fabled 33 club door are coated in Go Away Green. This helps all of these blend in and be passed over by the everyday visitor to the park. 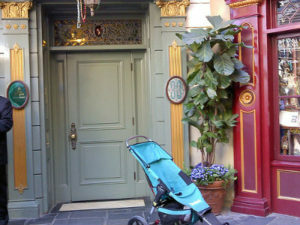 You may even find yourself parking a stroller in front of one of the fanciest parts of the park! You can cruise down to your paint store and pick up some of Disney’s concoctions yourself. This makes a great alternative to OD Green if you are bound by a home owners association, or are looking for a paint color that fits the grey man idea better. 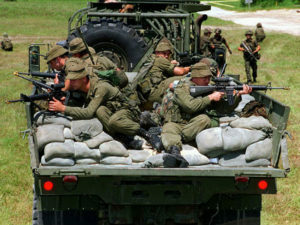 OD Green goes against the gray man idea, because it is so widely used for military colorings that it can be instantly identified as a ‘military color’. While it is less noticeable to wandering eyes, if it is noticed- it stands out. Go Away Green can help with this because it is less common, but can achieve similar camouflage results. To learn more about the gray man concept, check out our intro article: Becoming the Gray Man. 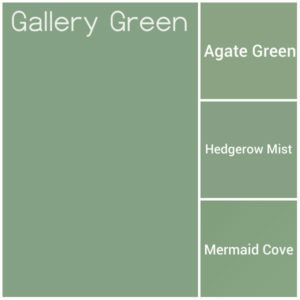 Paint your crawlspace doors, sheds, or even entire house Go Away Green to blend into the backdrop better. It works even better when paired with coverage foliage, like trees (especially evergreens), bushes, and even grass. You can vary these shades as much as you like, as long as you understand the the goal is to not stand out. Disney even employs a lesser-used “No See Um Gray” that is used as a complimentary color. When it comes down to it, I think Disney just likes giving everything they do and use unique names. Painting things green may be a little more science, and less magic- but that hasn’t stopped Disney from using it. The Disney parks are renowned all over the world for the immersive experience that they provide for kids and adults alike. Their use of Go Away Green to achieve this feat shows the power of camouflage even in everyday uses. Don’t be afraid to use camouflage yourself to get a small edge in security and safety. Keep exploring, stay prepared, and be safe.